With exactly one week to go before the start of the Vuelta a España, the riders of the Garmin-Cervélo team are preparing for the third Grand Tour of the year and what it hopes will be another successful display. 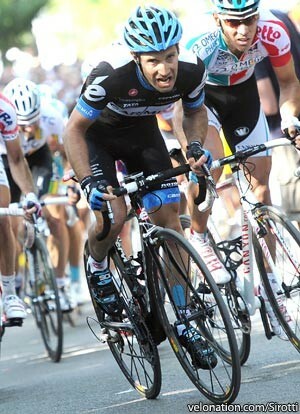 The team had a strong Giro, with David Millar winning a stage and wearing the Maglia Rosa for two days. The Tour de France was even better, with the team clocking up four stage wins plus the team classification, Thor Hushovd wearing the Maillot Jaune for a week and Tom Danielson placing ninth overall. The team will hope to keep that momentum going into the Vuelta a España. The leaders for the race will be Dan Martin, winner of the Giro della Toscana in May and runner-up plus a stage winner last week in the Tour of Poland, plus the Frenchman Christophe Le Mével. Like Martin, he missed the Tour and has focussed instead on being ready for the Vuelta. Like Martin, he is also trying to ensure that he is in peak condition. The team’s sprinting hope will be Heinrich Haussler, who moved to the squad from the Cervélo Test Team last year and has been trying to rebuild his form after missing most of 2010 due to injury. He is a quick rider who is also good on varied terrain and from the breakaway, as he showed when soloing to a stage win in the 2009 Tour de France. One who hasn’t made it into the squad is world champion Thor Hushovd. A double stage winner in this year’s Tour, he made it clear that he wanted to do the Vuelta in preparation for the world championships. However he has not been selected. “When you have a team as deep and talented as ours, roster decisions are very difficult”, said general manager Jonathan Vaughters. Some have claimed that the rider’s non-selection is related to Hushovd’s signing for the BMC Racing Team. Vaughters says this is not a key reason, but it is likely that it played a part, particularly as the points scored by riders this season accompany them if they move elsewhere.